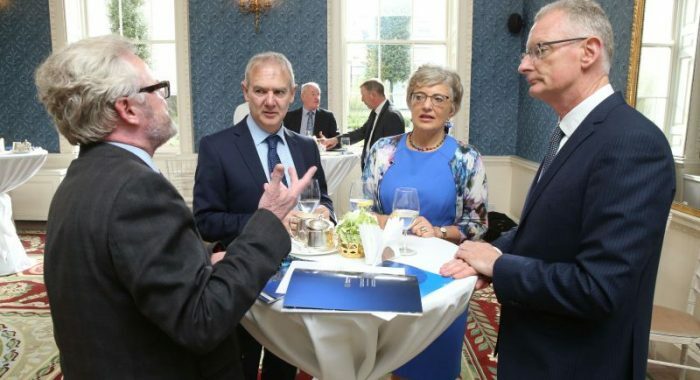 Left to right: Aebhric McGibney – Director of Public & International Affairs, Dublin Chamber; Peter Byrne – Chief Executive, South Dublin Chamber; Katherine Zappone TD – Minister for Children & Youth Affairs; and Ian Talbot – Chief Executive, Chambers Ireland. Photo: ‘Finbarr O’Rourke. Chambers Ireland and its network of Chambers from around the country gathered in Dublin today for the first Chamber Network Budget Dialogue, where they called on Government to ensure that investments committed to as part of the National Development Plan are delivered on as part of Budget 2019. Chambers also called on Government to tackle the high cost of doing business, the general high cost of living across Ireland and future skills needs. Over the course of the Chamber Budget Dialogue, Chambers Ireland also met with Minister Katherine Zappone and Minister Richard Bruton and spoke to them about our specific recommendations in our Budget 2019 Submission. “Government must focus on addressing the issues contributing to these high costs, from increasing the delivery of housing to making childcare more affordable. In past Budget submissions, we have particularly highlighted the need for substantial sustained investment in childcare services. The challenge in retaining women in the workforce has been highlighted as a concern for employers, and has been attributed, in part, to the difficulty employees have in accessing affordable childcare. By making childcare services more affordable and more accessible, we believe that the participation of women in the workplace will be increased. This in turn will reduce the gender pay gap and make our economy more competitive. In particular, we call on Government to ensure the prompt roll-out of the Affordable Childcare scheme and engage in long term strategic planning when it comes to maximising the use of state buildings. These assets are a valuable state resource and where demand exists, could be used to provide for early-education and after school care. Beyond childcare, recognising the need for the National Training Fund to be refocussed as we approach full employment, placing a renewed emphasis on apprenticeships and increasing the utilisation of lifelong learning opportunities will be critical.